Around the world those with power were conciliatory and wished to reduce harmful social and political divisions. Clement Attlee as Prime Minister between 1945 and 1951 tried hard to provide ordinary people with living accommodation consistent with self-respect, and to retain Britain’s status as a world power by continuing the development of nuclear bombs. His government established a system of health care in which there was a charge for only medicines, and a system where, at least in theory, a child of the poorest of families could have as good an education as could be obtained anywhere in the world. The unemployed and the elderly were entitled to social security money. Restoration of market forces in food was deferred and rationing extended to bread. Attlee’s Conservative successors accepted the welfare state and continued the attempt to preserve Britain’s status as a world power. The British economy was protected by taxing imports from countries outside the British Empire. Everyone in Germany, Japan, France and Italy could feel the essential nature of rebuilding their national economies but the need was felt less strongly in Britain. The 1945 general election was a landslide victory for the Labour Party, reflected in Leyton for which A E Bechervaise (Mayor of Leyton 1930-31) was elected MP for the Leyton East constituency and the Rev Reginald Sorensen for Leyton West. Whilst Leyton remained Labour in 1951, the Conservative Party won a comfortable majority nationally and remained in power until a victory by Labour under Harold Wilson in 1964. Patrick Gordon Walker, Wilson’s choice as Foreign Secretary, failed to win his Midlands contest. Wilson asked Reginald Sorensen to create a vacancy by accepting a peerage, so that Gordon Walker could fight the resulting by-election. 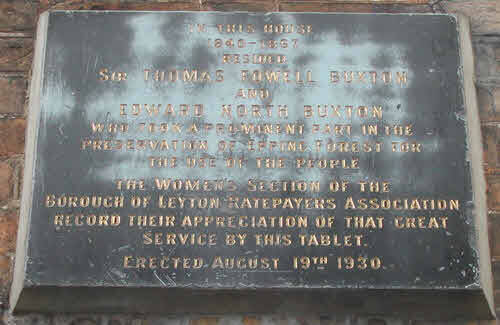 Leyton caused a national sensation by giving a narrow majority of votes to the Conservative candidate, Ronald Buxton, who was a member of the family who had once lived in Leytonstone House.